Description: Collection of treatises and notes by various authors. Consists of: a compilation of Shí`í Traditions about the Mahdi, pp. 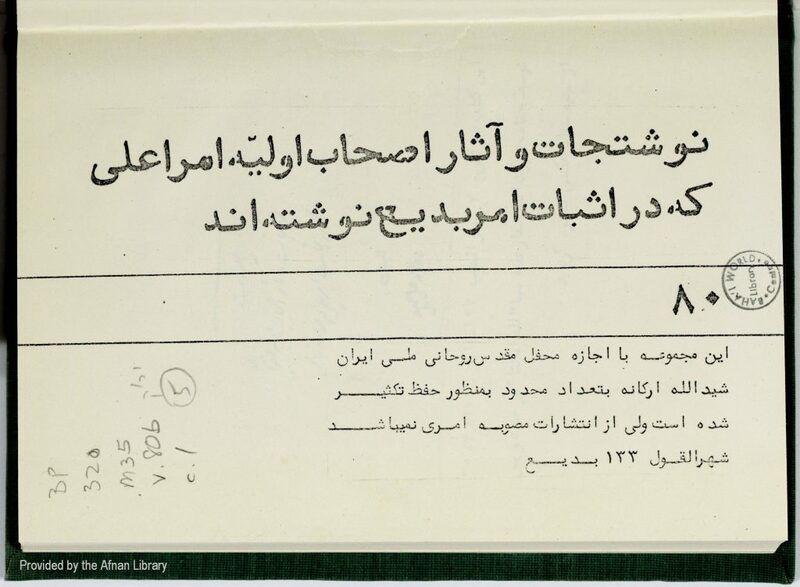 1-196; a compilation of Traditions about the Mahdi, stated to have been compiled by Mullá Husayn Bushrú’í and copied in Qáf (Qazvín), incomplete, pp. 198-211; a treatise in Arabic, author not identified, pp. 212-282; a treatise in Arabic, author not identified, pp. 283-309; a treatise in Arabic by Sultán ibn Khalaf ibn Hasan Sultán, pp. 310-332. 332 pp. of ms. (337 pp. of PDF).